How many files a user has been modifying since they started working. What the average is per year the user modifies. 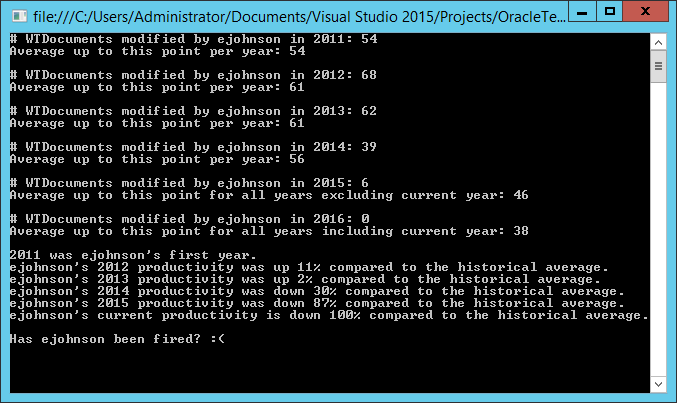 Compared to the current point in time, what the productivity rate is from previous years. Now I know this is a VERY rough way to calculate employee productivity but as a company starts to digitize more of their work into Windchill, it will at least be a way to see how your resources are doing. If you are a manager using this, you can see if your employee is ahead, behind, or right on track compared to their other years. I hope that if an employee seems to have a very low Windchill output that the manager would see why it is in a productive way i.e. not assigning enough work, not enough help for difficult work, etc. A count of all WTDocuments modified by my user since my user was first created. The above query finds all WTDocuments my user has ever modified. To separate out the data by year. 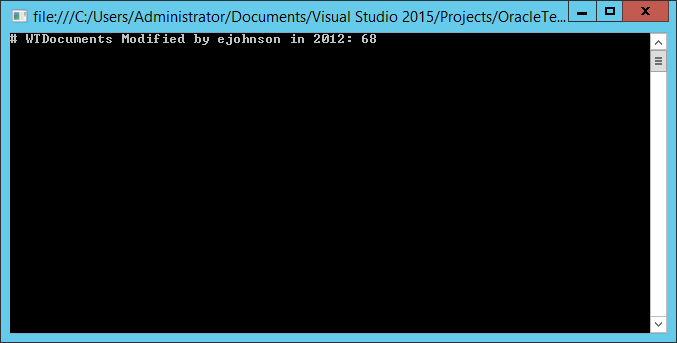 I am going to give a specific year here and make a loop in C# later on. I am now getting all WTDocuments I modified in a specific year (2012). I had to convert the date to my the server's local time zone in order to get an accurate count. 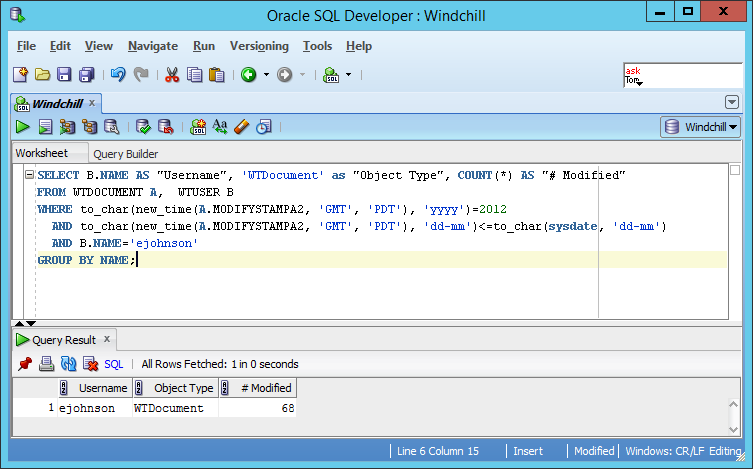 Windchill stores all data in the database in GMT time by default. All WTDocuments made from January 1 up to and including the current date in the same specific year. The query currently grabs all WTDocuments that the user created which implies that it knows when the user was created but it does not. I explicitly need to know when the user was created in order to give the user a fair first year outlook i.e. empty months will mess up first year average productivity. I decided to split up the date of my user's creation in because I feel it will be easier to work with later on having to just set each cell to a variable in C#. Since I have a working query, I need to program the logic in C#. I will start by doing a save as of an existing function (query1), rename it to queryUserInfo, and switch out the old SQL query with the new one. The only thing I want to point out here is that I had to convert the date to and integer. No onto the queryUserTrend query when the trend calculation will be performed through the data obtained from the first SQL query. Replace single " with double "" in my SQL query. 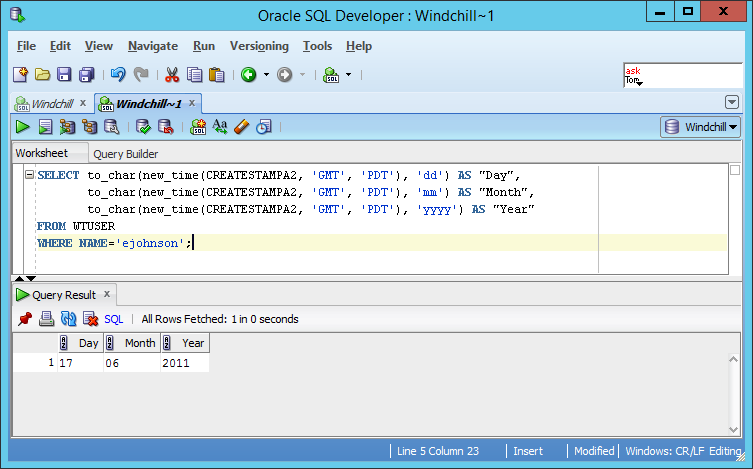 Adjust the Data Reader to read column 3 instead of 1. Time to convert this to a loop and calculate the average after each year. The code looks more complicated than it is. I am simply looping my query for each year since the user was created, calculating the average up to the selected year, storing the data in the userData array and then using that data to determine the percent productivity change.